Dal Bag offered by us are one of the most recognized and demanded in the manufacturing industry. These are best suited to pack all kind of dal as Toor dal bags. Designed and printed as per international quality standards, we can also deliver these as per the specific packaging requirements. Dal industries in India have always been the largest users of our bags in India as well as overseas. We have the packaging from 5 Kgs to 75 Kgs with a brand building designs. These Dal BOPP Multicolor Printed Laminated PP Woven Sack and Bag are made of premium quality raw material to ensure longer life. We offer these Dal Sacks for commercial purposes, specially to pack all kind of dal grains. 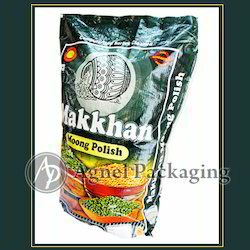 we can offer this Bags with Metalic ,Matt & Glossy Fiish Lamination with side Gusset & also in Transperent window so that the Dal can be seen from Both side the bags. This Bags will give Good Branding to the Product & has a very international look of the bag. We can assure the Best lamination & attarctive printing of the bag with Good design. The strength of the bag is very good & avoids Moisture. Looking for Dal Bag ?